After plugging Micro Mechanic into your car’s data port, the device promises to wirelessly relay real-time information to your smartphone via Bluetooth, which can help you instantly identify what’s wrong when any diagnostic light appears. Not only will it tell you what’s wrong in seconds, but whether there’s a minor or major issue, the app will also show you about how much it will cost to repair so you can quickly determine the best course of action. It will even send you automatic maintenance reminders to help ensure you never miss an oil change or another critical item. All of this certainly sounds great, but how can you decide if Micro Mechanic is the right OBD-II scanner for you? That’s the central question we’ll help you answer in this review. How Does Micro Mechanic Work? Originally developed by the Society of Automotive Engineers (SAE) to meet California Air Resources Board (CARB) regulations, OBD-II ports provide access to a vehicle’s diagnostic data. Although these ports have been standard in all vehicles sold in the U.S. since 1996, the technology used to read and decipher the codes they generate was initially too expensive for most consumers. However, over the past decade or so, it’s reached a point where they’re widely available at just about any retailer with an automotive section. Now, let’s zoom in and find out if Micro Mechanic is a basic or advanced device. Scan, Diagnose, & Reset Check Engine Light – With the press of a button, you’ll find out why your check engine light is on, including the code and the associated issue. Then, you can reset the light once everything’s been resolved. Repair Cost Estimates – Displays the national average for any repairs identified during scanning. Issue Urgency – Should you drive your car? How urgently should you have your vehicle inspected? The website advertises Micro Mechanic will let you know. Maintenance Schedule – Based on mileage, the device will recommend specific maintenance services. How Much Does Micro Mechanic Cost? One Micro Mechanic device is priced at $19.95, plus free shipping and a $1 web service fee. During checkout, you’ll have the opportunity to purchase a second device for an additional $9.95 fee. All orders come with a 60-day money back guarantee, less S&H, which you can request by calling OnTel Products customer support at 800-245-1754. What Can We Learn from Micro Mechanic Customer Reviews? Between iTunes and Google Play, we encountered nearly 20 combined user reviews for the Micro Mechanic app at the time of our research, who gave it an average rating of about four stars. There, common compliments cited ease of use, while frequent complaints related to less-than-stellar functionality. Specifically, that it’s scanning abilities were limited only to check engine lights. As we discussed earlier, the trickle down in technology over the years has made basic OBD-II scanning devices extraordinarily popular, not to mention inexpensive. In addition to local retailers, we encountered thousands of relevant results browsing online marketplaces like Amazon, Walmart, and Google Shopping (to name just a few). In many instances, they were priced under $10. 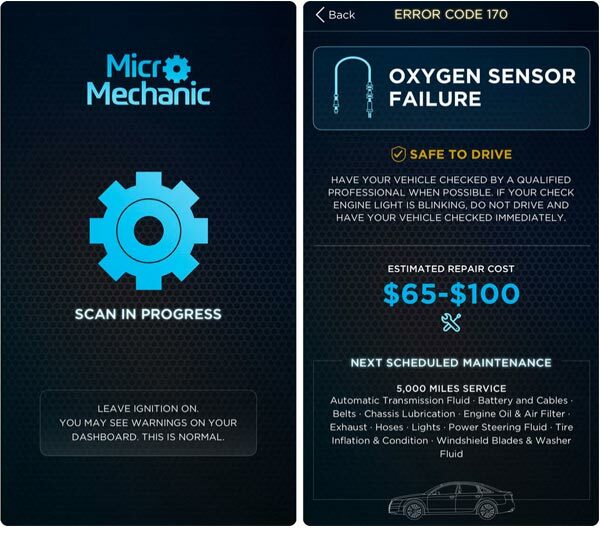 Like Micro Mechanic, most also featured app connectivity, the ability to scan, diagnose, and reset check engine lights, urgency determination, maintenance reminders, and repair estimates for any issues identified. There were even other standalone apps compatible with a variety of other OBD-II devices, including Torque ($4.95; Android only), OBD Car Doctor (Free; iOS only), and Carista (Free; iOS and Android). Considering their similarities and ultra-competitive price points, how can you decide which step to take next? Like most other products and services, you'll want to start by determining which features are most important to you. Power locks, windows, lights, and instrument display. You can even change the behavior of these aspects in some instances. With most technology, it’s often the case that the more features you need, the higher price you'll pay. However, we encountered many OBD-II devices with advanced features priced relatively in line with Micro Mechanic. From there, you’ll want to make sure that any company you do business with comes with a mostly positive online customer reputation, and stands behind their products with at least 30-day refund policies. 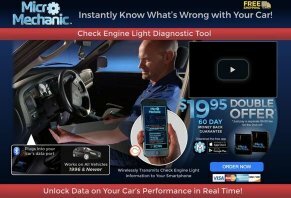 While we didn’t test any devices firsthand during the course of our research, Micro Mechanic seems to offer many core features that could provide meaningful value, including wireless Bluetooth functionality, app connectivity, the ability to diagnose, translate, and clear codes related to check engine lights; and mileage-based maintenance reminders. And as a company, NJ-based OnTel Products Corporation held a B rating with the Better Business Bureau, based on more than 30 customer reviews and nearly 370 closed complaints, as of 6/26/18. While many of these related to product quality and service concerns, a company representative responded in each instance with a solution. They also stand behind Micro Mechanic with a 60-day refund policy, although you’ll have to pay to ship it back to the manufacturer (you’ll lose any fees associated with the BOGO offer as well) if you give it a try and end up dissatisfied. Just keep in mind that even though they draw very little power, we encountered dozens of online customers reporting that their battery died after leaving third-party OBD-II devices in place and parking their car for several days. So if you travel frequently, it might be a good idea to remove Micro Mechanic in advance. I tested on two vehicles that are known to have issues that were verified by O'Reilly Auto Parts using their OBD-II system. Both vehicles showed zero results and we tried using multiple compatible apps. Returned to O'Reilly and got the correct (expected) results a second time. This device is no good. Simply does not work at all. The apps may be fine, but the device is not reporting. Just got one, left it in the car and the engine stalled, so I took it out and it runs fine! I tried and it said all systems were fine and I have a brake warning light on for pad wear! In any case, I will try it on my other car, which has an EVAP code pending! The additional code purchase makes me leary, but we will see, so far not impressed! I'm a Master Mechanic of 30 years, my home scan tool got melted in a house fire. Picking up medicine from Walgreens and I saw this. Ok, 20 bucks, so I thought I'd check it out. I figured it would do basic stuff until I replaced my good one. This is a joke, said no problems found and my check engine light was on. The device would do NOTHING else. Going to take it back. I can get more information with a couple of pieces of wire by shorting two contacts on the plug. That will at least blink the code number then you can look the code up. Not worth the effort to plug it up. This is the worst piece of crap, never worked. I failed the emissions test, this device scanned and said safe to drive. Doesn't pick up any issues, I am very disappointed with this purchase. I hooked it up to about 7 or 8 different cars and tried it and with the app they have it says just random stuff like one was bad ECM. Then you close the app, reopen, and nothing. And on another said my wife's turbo wastegate is bad, it doesnt even have a turbo. Such junk, save you cash and get an ELM off Amazon. It's a big scam. Class action lawsuit headed your way. Can't wait. Doesn't say anything unless you want to pay, doubt it that it does, paid enough for this scam. Big time scam. It just tells you what regular maintenance you should do. We all know this. Says you need to pay for more info. Right, I'm going to pay for you to tell me the same crap. No way. You got $20, you will get no more. I would rather spend the hundred dollars and get the truth than be scammed. You all are such liars, your product doesn't do anything but Bluetooth. Such liars. Can't wait for a class action lawsuit. Which I will actively be involved in. What a lie you promote. It's time to take our money back for this piece of crap. Do not buy this piece of crap! This does not work. When you give them your payment stuff they say that it will not go through, "do you have any other card to use," and I just hung up returning it to where I bought it from. This place is BS! DO NOT get this item, it does NOT work! I have not had any problems with the Micro Mechanic on my 2010 Equinox. My check engine light was on and told me my oxygen sensor was bad, replaced it and reset check engine light no problems at all for me. I had no problem connecting, had three dash lights on, Micro Mechanic came back, no problems found. I tried three times and got the same result. I went to AutoZone and within 5 minutes found two trouble codes. I feel like this product is all hype, absolutely worthless. I called customer service and all they said was, quote, "have a nice day and thank you for purchasing Micro Mechanic." Really? The car is worthless now after using it on 2002 Saturn SL100. My car had no problems that kept me from getting in my car, starting it, and driving off. It had two codes error, and after clearing it, my car never started again. Do not purchase. Does not read codes on 2004 Silverado. Pro dashboard shows zero info on my truck. Pro dashboard worked for about two minutes on my wife's 2015 Infinity but quit. This is a complete scam, which I should have known when I purchased due to the 19 pages I had to decline "extras," but still ended up spending 40 bucks on something I thought I was going to get for 20. Write a Review for Micro Mechanic!